The Oidrema Sauna is the perfect place to escape to from the city noise; relax in the fresh air, have fun, enjoy the sauna and wash off the burden of the week. It is ideal for company outings, celebrating anniversaries, family vacations or just for taking some time off from your everyday routine. The lounge room table seats up to 25 people, the classical stove heated sauna around 15 persons. Also there is a big 60m2 terrace to go to cool off after the sauna. 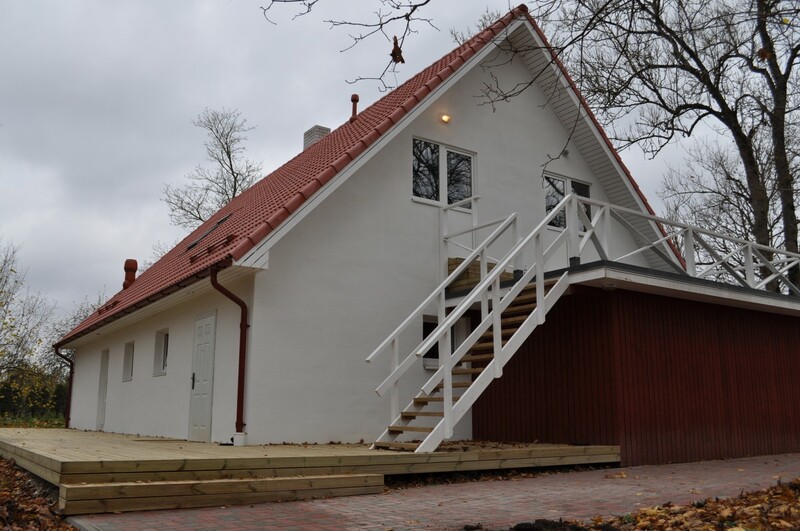 The sauna complex has a well-equipped kitchen and soon to be added outdoor BBQ area, where warm evenings offer an opportunity to enjoy cooking in the open air. On the second floor there are comfortable single and double beds that sleep upto 12, divided between 4 rooms. Ask for catering options at oidremasaun@gmail.com. On Sunday evenings the sauna is open for the use of villagers. As the sauna complex is recently opened and there are still some exciting additions on the way, such as the jacuzzi and the steam room to the wet room.